To explore “Amundsen Sea West Antarctic Ice Sheet History: Development and sensitivity of the West Antarctic Ice Sheet tested from drill records of the Amundsen Sea Embayment” as part of the International Ocean Discovery Program (IODP)(*1), a research expedition using JOIDES Resolution (*2) prepared by the United States will begin on January 18th. 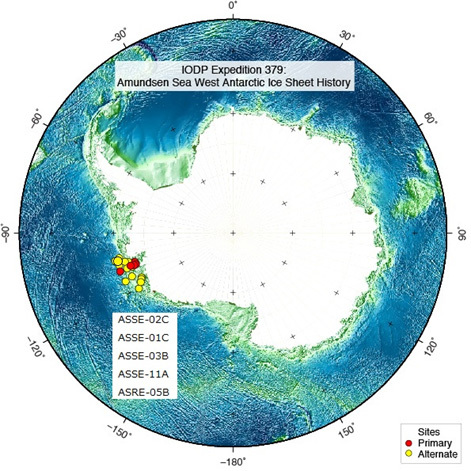 In this research expedition, we will drill the continental shelf and the ocean floor proximal to the continental shelf of the Amundsen Gulf (Figure 1) in the margin of the West Antarctic Ice Sheet (WAIS) where the most pronounced glacier retreat is observed in Antarctica. The aim is to clarify the ages at which continental deposits and unconformities were formed through expansion and contraction of the WAIS and reconstruct the marine environments of ice sheet margins in order to explain the relationship between the ocean, climatic conditions, and the growth and decay of the WAIS. In this research expedition, a total of 29 researchers, three of whom will be from Japan, and others from the United States, Europe, New Zealand, China, India, and Korea will be on board. *Figure 1 is cited from the IODP website with partial modification.